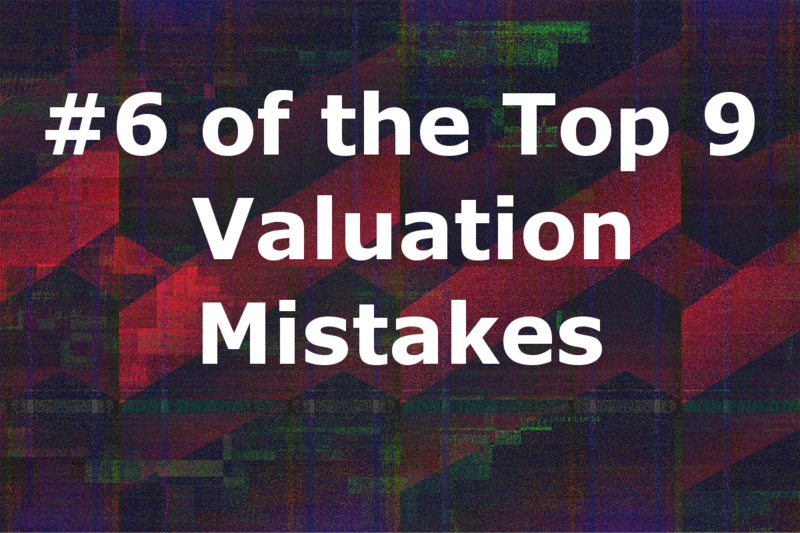 If you're jumping in halfway through the series here, be sure to catch up with the beginning Top 9 Valuation Mistakes below first. Now, Let’s dive straight into Valuation Mistake #6 in this chapter: Understanding working capital investment. We’ll begin by taking a look at net working capital (NWC) from a valuation perspective versus an accounting perspective. This will form the foundation for how we begin to understand working capital investment better. Valuation uses the change in free cash flow to look at NWC, though we exclude cash and short-term borrowings because we account for them later in the valuation process. Let's examine these items through data from the last chapter and my study of all listed companies across the world. The fact that there are 17,000 provides us with a good enough sample. 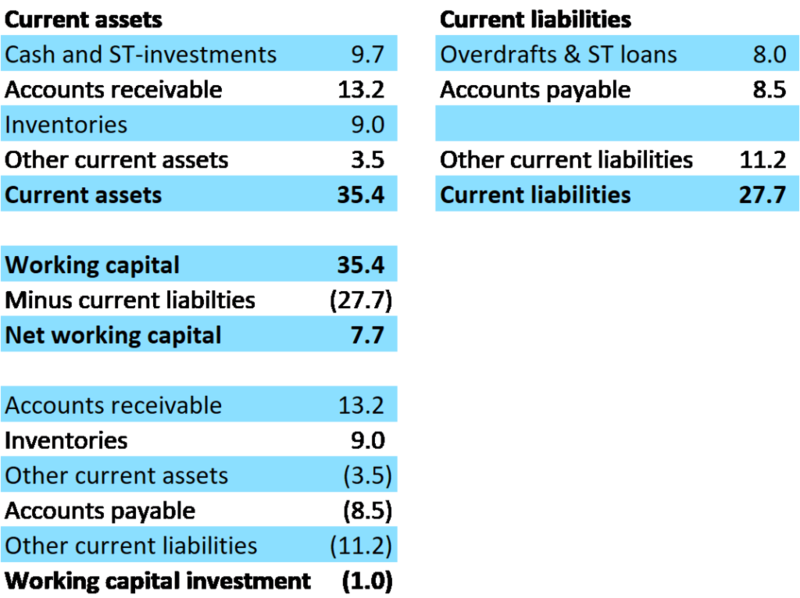 As we can see, if the total assets were 100% for each company, 35% would be allocated to current assets and 27.7% is the amount of current liabilities relative to total assets. Let's look at free cash flow and the general concept of how we calculate it. The resulting “basic cash flow” should be a positive number. Next, we take away two different items. Those two combined is what I call “total investment” and this is usually a cash outflow. NWC reduces free cash flow but supports growth. In valuation, think of the change in NWC as an investment, an investment in fixed assets. Usually, it’s a cash outflow and, therefore, it reduces the free cash flow. 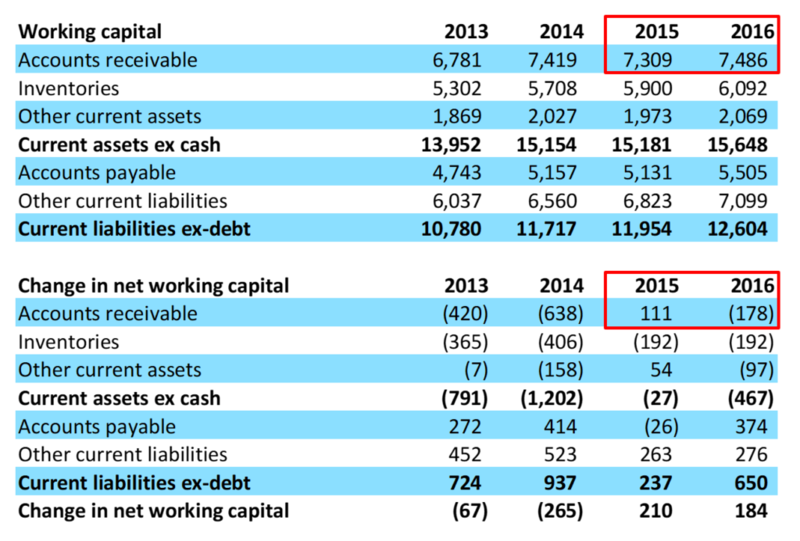 Let's review working capital below for a moment (Fig. 6.4). 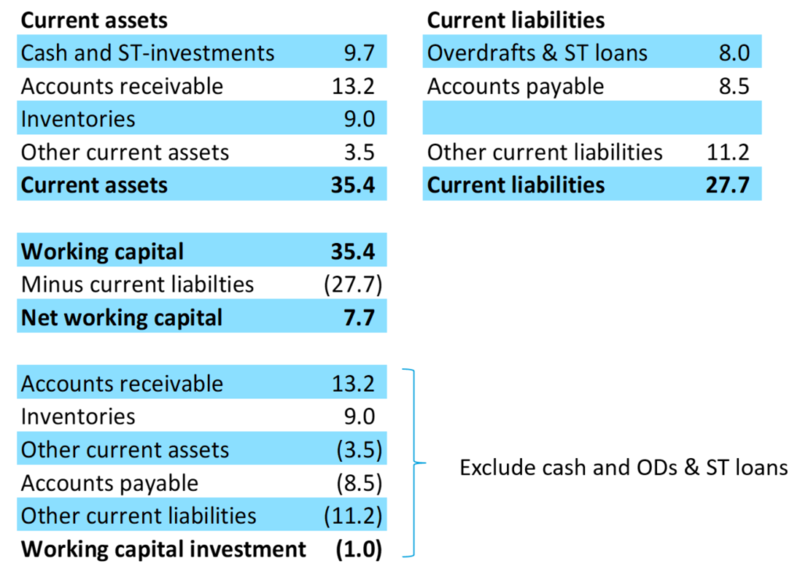 We could say that working capital in the traditional sense is the amount of current assets that we have minus current liabilities, in this case, 27.7, and that’s how we end up with the NWC. That's the traditional accounting perspective at least. But if we look at it in the case of finance and free cash flow calculation, we remove the cash and short-term investments, and the overdrafts. That leaves us with accounts receivables, inventories, other current assets, and accounts payable; and other current liabilities are the liability side of that. Now, let's take a look at how we get to this result of (1). First of all, I take the balance sheet of a company [Fig. 6.6]. We can see that the accounts receivable increased from 7,309 to 3,486. An increase in an asset means that you're using cash and, therefore, it's a negative item. We can see below minus 178 (178). And if we add these up, we can get to the bottom, the change in NWC, which is 210 and 184. Those are positive items in those years; but in prior years, they're negative items. So, we can see it's the change in working capital that matters for forecasting in valuation. Let's examine this same data set across all companies (Fig 6.7). 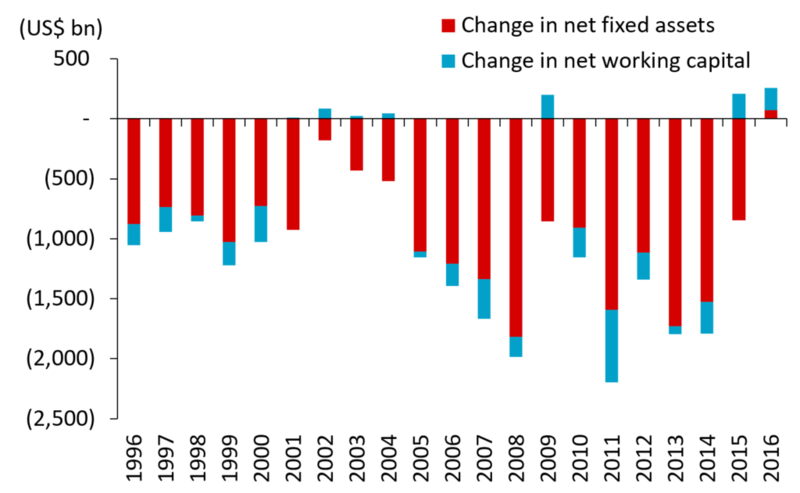 We can see that there’s a change in net fixed assets is always a negative, almost always, with 2016 being an exception. For almost all years though, the change in net fixed assets—sometimes, called the “CAPEX”—is usually a significant negative amount. The change in NWC can be positive or negative, and though it's a smaller item, it's still volatile. Always begin by reviewing the company’s prior trend in NWC. Does your forecast fit that general trend? Look at Company A for example (Fig 6.8). It's got negative figures for the past three years. So, would a forecast of positive, positive, positive make sense here? Very unlikely! And then there's Company B with three positive years, so would a negative future forecast fit this business? So, when forecasting deviations from that trend, have a strong reason and tell the accompanying narrative accurately. There's nothing wrong with forecasting a change or a difference from the past—just be able to back up your analysis. What a great opportunity to tell the story that you're seeing! In valuation, and unlike in accounting, we exclude cash and short-term borrowings from NWC. Changes in NWC are volatile because that change results from five separate forecasts. NWC is a small, but volatile investment item. Large deviations from past trends are usually a mistake, but if it's not, be sure to explain it carefully. That wraps up Mistake #6. Next, we're going to look at valuing a stock using the calculated Beta, mistake #7. I'll see you there!